We have been on a bit of a macro-photography binge lately. We have done some fun and creative things with the Lensbaby in the past. A recent “ah ha” moment led us to realize that it may be interesting to mount the Lensbaby onto a bellows and use it as a macro lens. 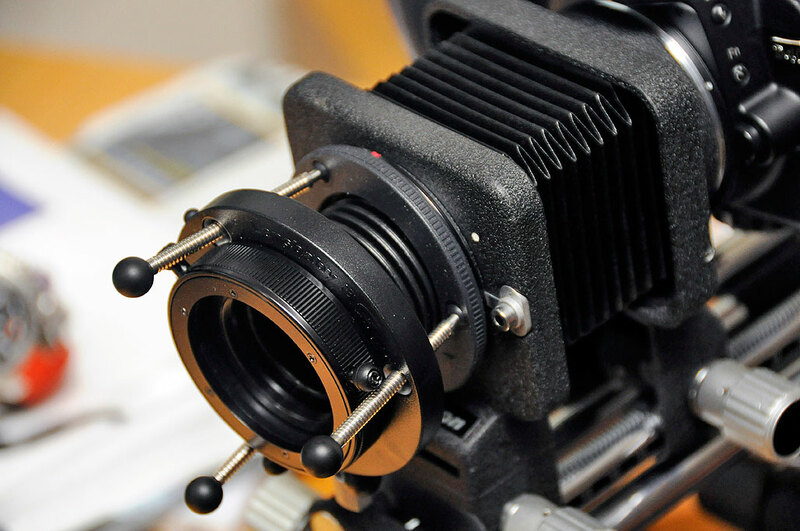 While we know we could mount the lens, we were not sure if we could get it to focus. There are macro accessories for the Lensbaby 3G lens. However, the bellows, if it works, would give us the option of playing with the amount of magnification on the fly. The downside is that the rig would be a bit unwieldy. The use of a tripod to support it would be a must. Besides, with six different adjustibale knobs, it would be impossible to hold the contraption and manipulate the controls at the same time anyway. We had no problem mounting the Lensbaby onto the Nikon bellows. It was figuring out how to get things into focus which took a bit of trial and error. We chose the f/4 aperture plate as it gave a brighter image as seen through the viewfinder. While the depth of field of the Lensbaby can be adjusted from f/2 to f22, it had to be done by physically swapping plates with different size openings. The brighter opening fo the f/4 made manual focusing easier, but it was still hard to do precisely. So, when our shots kept ending up out of focus, we had trouble determining the root cause. After a lot of fiddling and a few dozen test shots later, we finally got the hang of how the image changed with the turning of the different knobs. After confirming that our Lensbaby/bellows setup will actually work, we took the assembly outside in search of more interesting subjects. The gallery below is the result of our morning’s effort. The image of the fly was particularly serendipitous. If we had been able to see the focus better, we would have had the eyes in focus instead of the body.